Is Daoist religious practice really Daoist? This questions seems to be endlessly circulating on the English language internet of Daoism and no matter where one turns, it always seems to be the the case that many experts are willing to come out in a denial of any significant relationship between Daoist religious practice and their imagined conceptualization of the vague historical Daoist philosophy of 2500 years ago. Aside from the fact that we have very few Daoist texts available from the earliest periods of the development of the Daoist school of though, and that many of them such as “The Teachings of Classifying the immortals” have specifically religious connotations, it is quite evident that Daoist religion shares more in common with the core texts of the Dao De Jng and Nan Hua Jing (Zhuangzi) than differences. In this brief post, I would like to discuss some Daoist Deities and how they represent core concepts in Daoist thought, and hopefully why you should learn to respect the Daoist religion as one of the myriad manifestations of Chinese Daoist culture. In Quanzhen Daoism, the three most central deities beyond the great Dao of Non Polarity (Wu Ji Da Dao) there are three great deities known as the San Yuan, or Three Originals. – Dao De Lao Jun (the Gentleman of the Dao of Virtue). Together, these three deities comprise many different Daoist and Chinese cosmological, spiritual and cultural ideas. – The Three deities together make up the Chinese concept of “San Cai,” which means the three levels of heaven, humanity, and the earth. in Chinese and Daoist thought, heaven and earth are the purest forms of yin and yang and humanity is the only creature which is able to fully absorb the lessons of yin and yang and their transformation. In this case, The Venerated Heavenly Elder of the Original beginning refers to the heavens, open, vast, and constructive, he has no form, but contains all within him. The Venerated Heavenly Elder of the Spiritual Treasure refers to earth and the ability to sustain life. In Daoism, this deity is often associated with the concept of “Jing” essence and the ability to become alive. The Gentleman of the Dao of Virtue represents humanity and is the heavenly and eternal incarnation of Laozi, the human who delivered the Dao teachings to humanity via the Dao De Jing. On another level of analysis, these three deities represent the concepts of “Yuan jing, Qi, and Shen” or the original essence, energy, and spirit of living things. Original Jing, Qi, and Shen are formless and are associated with the development of a new life in the womb, with the body coming from the original essence, the vital energy coming from the original qi, and the mind coming from the original spirit or consciousness. 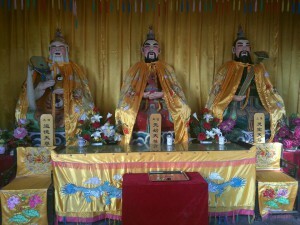 Different Daoist thinkers have placed these deities in different order, but the two most popular interpretations are that Yuanshi Tianzun represents either the original spirit or original essence, Ling Bao Tianzun represents original essence, or original spirit, and Dao De Lao Jun represents original Qi. Regardless of these interpretations, these three deities are literally manifest in each of our bodies and are the most essential components of our existence, from physical material (jing) to our animating energy (Qi), to consciousness (shen). Daoists view the body and mind as sacred and thus the three greatest deities of the Dao are seen as being the patrons of these aspects of self. Finally, Yuanshi Tianzun literally refers to the concept left behind in Liezi of “Yuan Shi” or original beginning. This beginning is what Laozi calls “at the beginning it was without name,” and refers to the incubation of created reality by the empty and nameless Dao. Ling Bao tianzun refers to the possibility of life, and Dao De Tianzun refers to the energy of life. Together they make up Laozi’s three pillar concepts of Xi, yi, and Wei, or subtle, hidden, and minute. So regardless of other interpretations of these deities and their attendant rituals, the San yuan actually represent a huge amount of very real theory from the Dao De Jing, Nan Hua Jing, and Lie Zi. Other deities such as the three officials represent aspects of nature, the body and the mind, but this is enough for today. I think it is quite important that we don’t closed mindedly reject Daoist religious teachings out of a romantic sense of some mystical philosophical era in ancient Chinese history. It is better to understand the practical interpretations of these beliefs and then come to a more informed judgement about them which doesn’t lead to cultural bigotry and chauvinism.